CardView is another major element introduced in Material Design. Using CardView you can represent the information in a card manner with a drop shadow (elevation) and corner radius which looks consistent across the platform. CardView extends the FrameLayout and it is supported way back to Android 2.x. You can achieve good looking UI when CardView is combined with RecyclerView. In this article we are going to learn how to integrate CardView with RecyclerView by creating a beautiful music app that displays music albums with a cover image and title. To use the CardView in your app, add the CardView dependency in build.gradle and Sync the project. Add the <android.support.v7.widget.CardView> widget to your layout and place other UI widgets like TextViews, ImageViews inside it. You can notice that the below CardView widget contains a single TextView. Now let’s see this in action by creating a new project. 1. Create a new project in Android Studio from File ⇒ New Project. When it prompts you to select the default activity, select Empty Activity and proceed. 2. Download this res.zip and add them to your projects res folder. This res folder contains few album covers and icons required for this project. 3. Add the below strings, colors and dimen resources to strings.xml, colors.xml, styles.xml and dimens.xml files. 4. Open build.gradle and add CardView, RecyclerView and Glide dependencies. RecyclerView is used to display the albums in grid manner. 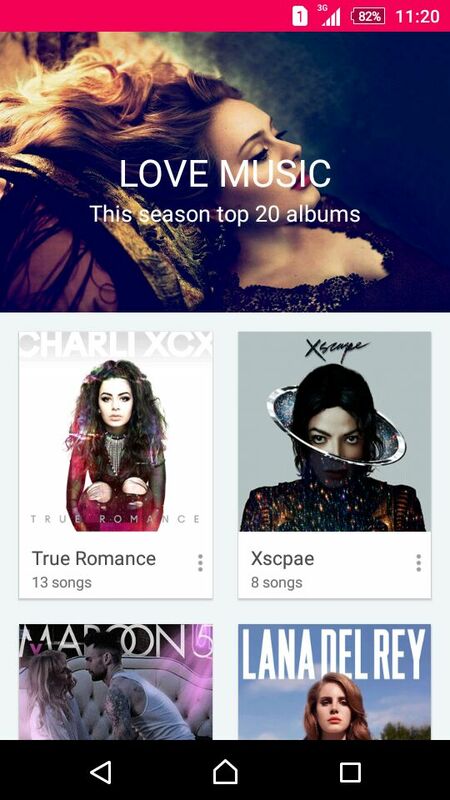 CardView is used to display single album item. 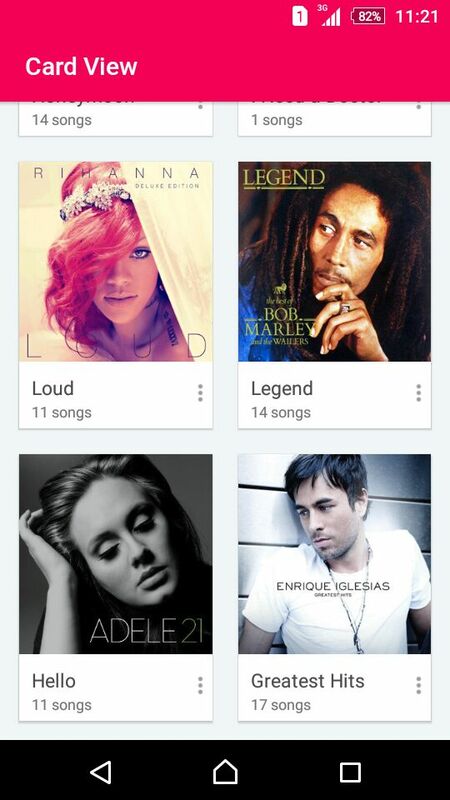 Glide is used to display the album cover images. 5. To create instance of a single album, we need a model class denoting the album properties like name, number of songs and cover image. So create a class named Album.java and add the below code. * Created by Akshay Raj on 8/9/2016. 6. We also need an xm layout to display the album card. Create an xml layout named album_card.xml under res ⇒ layout. 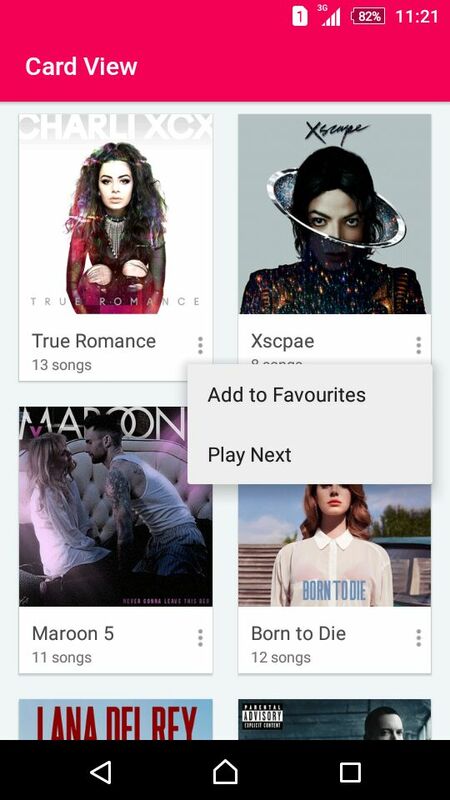 Here you can notice that I have added <android.support.v7.widget.CardView> and added all the album properties like name, number of songs and cover image inside it. I also added a 3 dot icon which shows a popup menu on tapping it. 7. Create a menu file named menu_album.xml under res ⇒ menu folder. This menu will be shown as popup menu on tapping on dots icons on each album card item. 8. To render the RecyclerView, we need an adapter class which inflates the album_card.xml by keeping appropriate information. Create a class named AlbumsAdapter.java and add the below content. 9. Open the layout files main activity activity_main.xml and content_main.xml, add AppBarLayout, CollapsingToolbarLayout, Toolbar and RecyclerView. 10. Finally open MainActivity.java and do the necessary changes. • initCollapsingToolbar() – Shows or hides the toolbar title when the toolbar is collapsed or expanded. • prepareAlbums() – Adds sample albums data required for the recycler view. • GridLayoutManager is used to display the RecyclerView in Grid manner instead of list. • GridSpacingItemDecoration is used to give equal margins around RecyclerView grid items. • AlbumsAdapter instance is created and assigned to RecyclerView which renders the CardView albums in grid fashion. If you run the app now, you can see the album CardViews displayed in a grid.